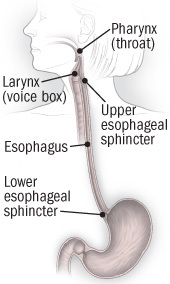 The esophagus is the muscular tube that carries food through the chest, from the mouth to the stomach. Normally you don't feel it except when you are swallowing. However, if the inside lining of your esophagus becomes inflamed, you may experience pain or problems with swallowing. This inflammation of the esophagus is called esophagitis. Acid reflux — By far the most common cause of esophagitis is acid reflux (also called gastroesophageal reflux disease or GERD). It is a backflow of digestive acid from the stomach, resulting in a chemical burn of the esophagus. 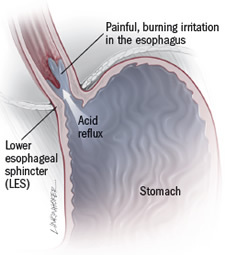 Eating disorders — Similar to acid reflux, frequent vomiting can cause acid burn in the esophagus. Esophagitis sometimes is seen in people with eating disorders such as bulimia. Chemotherapy and radiation therapy for cancer — Some of these treatments can injure the esophagus lining, resulting in esophagitis. Infections — Infections in the esophagus also can cause esophagitis. They usually occur in people with a weak immune system. Esophagitis from infections is common in people who have HIV infection, use steroid medicines long-term, have had organ transplants, or have been treated with chemotherapy for cancer. Even in someone who already has a herpes infection in the mouth, it rarely spreads down to the esophagus if the immune system is normal. Pain in the chest (behind the breastbone) or throat. The pain can be burning, heavy or sharp. If acid reflux is the cause of esophagitis, the pain may be worse after meals or when you lie flat. Pain from esophagitis may be constant or may come and go. The diagnosis often is made based on your symptoms.